Pakistan is currently the eighth-largest producer of textile products in Asia. Textiles contribute about 8.5% to the total GDP of the country each year. More than 15 million people, or about 30% of the total workforce in Pakistan, is employed somehow in the textile trade. The industry is currently comprised of more than 1,200 ginning units, 440 spinning units, and 124 large spinning units. Pakistan is also the 4th largest producer of cotton products and is the fourth-largest consumer of cotton as well. 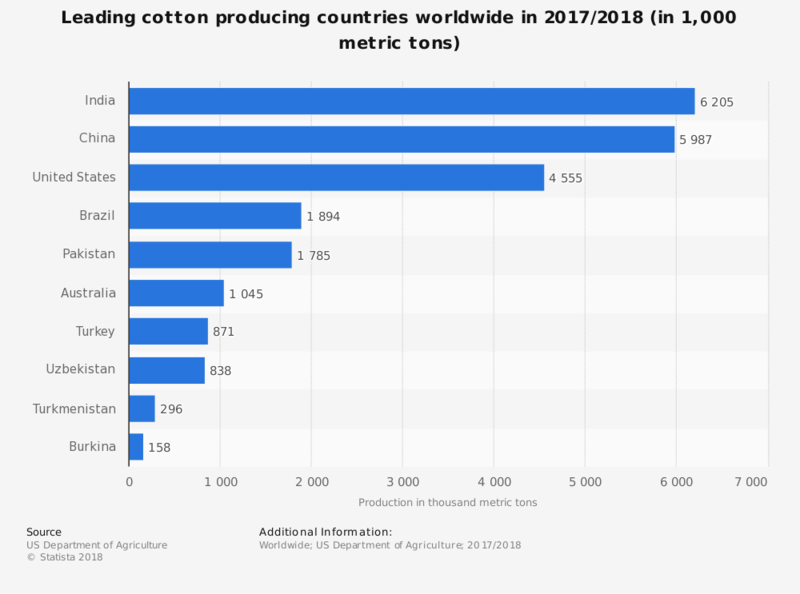 Although cotton production in Pakistan is about 4 times higher today than it was in the first reported production year of 1960, the industry has been locked into a cycle of static production since the mid-1990s. In 1991, 2004, 2011, and 2014 the industry was able to achieve over 10 million 480-pound bales of cotton. In the average year, the industry produces between 8.5 to 9.5 million bales of cotton. In 2018, the Pakistan cotton industry maintained this static trend, producing 8.5 million bales, which was 3.66% higher than production rates from the year before. 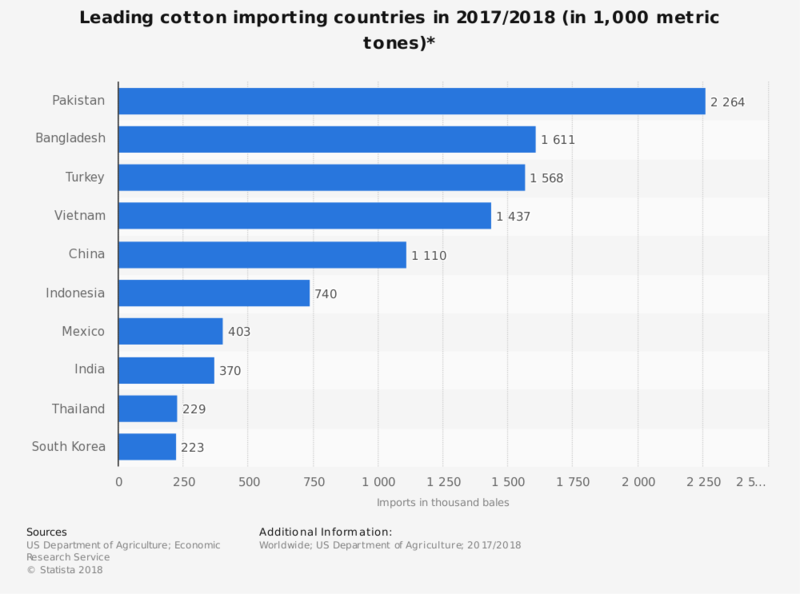 Some of the statistics presented by the cotton industry in Pakistan are included in the overall textile industry reports as both industries are often reported together. The cotton industry is Pakistan is heavily reliant on three external factors: weather, government policies, and regional conflict. Although the industry has seen general patterns of growth, the amount of cotton produced in the country has been relatively unchanged since the harvests in the mid-1990s. Part of the reason for this is that farmers are able to produce more cotton per acre consistently than ever before. With the addition of biotech cotton, yields are consistently higher, even in years where performance levels would be poor. Because of this shift in the industry, more crop years are expected. Since 2010, 50% of the largest yields recorded in the history of the industry have occurred. With textile exports on the rise in Pakistan as well, reaching an average of $1 billion per month, the demand for cotton will continue to rise. Look for the government to enact policies which will encourage more domestic growth, allowing for a reduction in import cotton and its costs to occur. Over the next 5-year period, expect cotton growth to remain steady, as well as the number of farmers involved with the industry. Production levels will stay consistent, but values may increase, contributing to a greater percentage of the total GDP.